With It All Said and Done, Where Does Ben Askren Sit in Welterweight History? Among the welterweight greats sit names like Hughes and St. Pierre — so where does Ben Askren’s name fall? 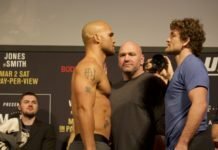 In his retirement bout Friday at ONE Championship: Immortal Pursuit, welterweight champion Ben Askren was nothing short of dominant. You could argue his opponent was undersized, as Shinya Aoki was a former ONE lightweight champion. That would ignore the fact that Aoki was a former Shooto welterweight champion who has bounced from 155 to 170lbs for years. The reality is that Askren did to Aoki exactly what he has been doing to opponents at all levels since his professional debut: dominating them through mastery of a single discipline. In Askren’s case, of course, it’s wrestling that paid the bills. Through dominance of those opponents, the question of Askren’s greatness arose. Yet the fact that, like Fedor Emelianenko, he never set foot in the UFC, muddied the waters. Of course, in The Last Emperor’s case, Pride’s supremacy, at least for a time, buoyed the claims of those who felt the Russian was the greatest heavyweight ever. Askren however never had a run in a promotion considered “the best.” Outside of his first three fights in 2009, the two-time NCAA wrestling champion and former Olympian spent the entirety of his career in Bellator MMA and ONE Championship. The UFC? While it’s not fair to say they didn’t come calling, they simply weren’t willing to look past Askren’s blanketing style. Nor were they looking to legitimize a champion from their top competitor. When Askren came on the market following his Bellator run in 2013/14, there was a chance to see him move to the Zuffa-owned outfit. It’s clear that Askren wanted it, it’s equally clear that he and Dana White butted heads. Ultimately it wasn’t to be. So without Askren ever having fought in the world’s “leading” MMA promotion, how do you judge his career against the likes of Hughes, Lawler, GSP, Miletech and others? If you’re going to examine Ben Askren’s career as a what-if, than there is one particular fighter who is a good place to start: Demian Maia. Like Askren, Maia is a throwback. Straight out of an era where single-discipline dominance was more than enough to get by on. While modern MMA fighters are multi-faceted masters, the origins of the sport were discipline vs. discipline. Excellence or outright dominance in just one could propel a fighter to a title. Those days seem long gone, fading along with the Gracie family. Yet Maia remains, a living dinosaur torn from a bygone era. In the UFC, he has challenged for a title twice, in two different weight classes. With a skill set at a level similar to Askren (albeit in another discipline), he has dominated nearly ever competitor he has faced. Carlos Condit, Matt Brown, Jorge Rivera, Gunnar Nelson, Rick Story, Jon Fitch, Chael Sonnen. Maia has survived a decade in the UFC relying mainly on his insanely tight jiu-jitsu game. Now ask yourself how Ben Askren would fare in the UFC welterweight division. Would GSP give him fits? Of course. The Canadian is one of the greatest fighters of all time, from any weight class. He’d give him fits the way he gave Jake Shields fits, when Shields moved over from Strikeforce. That’s not to say Askren wouldn’t find success in the company. Can We Stop Pretending the UFC is That Far Ahead? There’s another factor at play as well, and that’s the UFC-centric fairytale the general public has been sold, where the UFC has all the best fighters. The truth is, they don’t. They never have. In the mid-2000s, it was Pride. In the late 2000s, it was Strikeforce. Later, it was Bellator. In Asia, it’s ONE Championship. There has been competition all along, but out-of-sight, out-of-mind. And off of any number of sports pages and MMA websites. Yet the world is quickly learning that there is a wealth of talent outside the UFC’s confines, and not just because of all the defections to Bellator of late. UFC Shanghai went down Saturday, and was the promotion’s debut in mainland China. Interestingly, ONE Championship, Askren’s home over the latter half of his career, beat them to the punch by over a month, with ONE: Shanghai taking place this past September. Askren fought his penultimate MMA fight there, a win over Zebaztian Kadestam. If you have no idea who Kadestam is, you’re forgiven. The Swede isn’t exactly a household name. Neither were Song Yadong and Wang Guan, prior to UFC Shanghai. Yet both picked up wins over established UFC fighters in their promotional debuts Saturday. Does that tell us something about the quality of fighters now emerging from Asia? Does it tell us that maybe the UFC’s value as the “pinnacle” of MMA is a tad overstated? Yes and yes. Askren’s level of competition in ONE isn’t as recognized or tested as that he would have faced in the UFC. We need to stop judging the quality of fighters based on the existence of Wikipedia entries and English-language interviews, however. MMA has long been an international sport, and it’s not just Brazil and Canada who have made inroads. There is tough competition to be found almost anywhere in the world, and more than enough fights globally to produce dozens of quality fighters outside the UFC’s ranks. It’s not just ONE, either. Go back to Askren’s Bellator days, and argue that Douglas Lima is a slouch, now that he holds wins over Lorenz Larkin, Paul Daley, Ben Saunders, Rick Hawn, Steve Carl, and others. Or Andrey Koreshkov, who has a win over Lima, Benson Henderson, Lyman Good and many more. The point of this argument isn’t MMA math. It isn’t that because Askren beat Lima and Koreshkov (or better yet, wiped the canvas with them), that he’d win over all those other fighters. It’s that again, quality of competition is more than just fighting in the promotion that gets the best ratings. We’re learning that now, as UFC fighters joining Bellator have struggled. That puts Askren’s career in a whole new light. 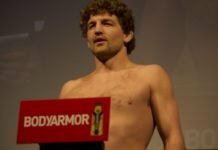 So Where Does Askren Sit in Welterweight History? Top ten, bordering on top five if only we’d seen more of him. Because it matters that Askren went to another promotion and continued his dominance there. It matters that he held belts in two of the three biggest MMA outfits active today. It most certainly matters that he trains with some of the best, including UFC welterweight champion Tyron Woodley. His career will forever be a what if because he didn’t fight in the UFC. That doesn’t mean it should be written off due to the absence of those three initials. In the end, Askren was one of the greatest of his era, and he did it his way. Next articleWhat Would a UFC Heavyweight Grand Prix Look Like in 2018?